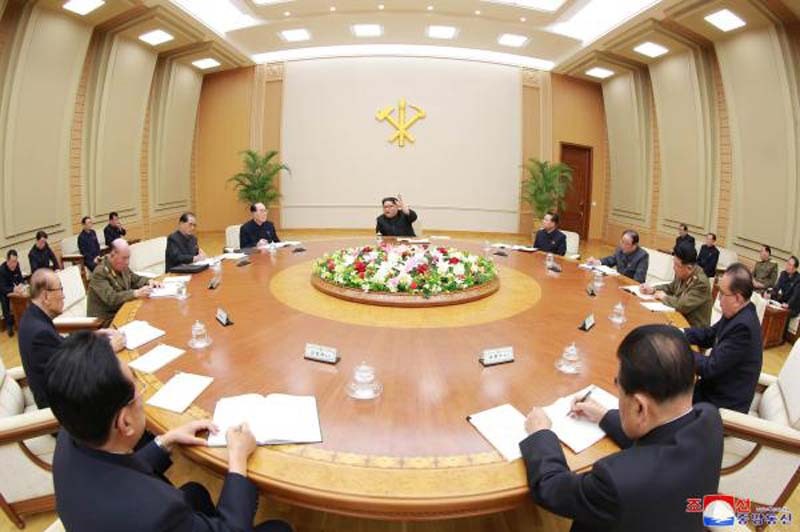 A photo released by the North Korean Central News Agency (KCNA), the state news agency of North Korea, shows a meeting of the Political Bureau of the Central Committee of the Workers' Party of Korea held on under the guidance of Kim Jong Un, chairman of the WPK and chairman of the State Affairs Commission of the DPRK, in Pyongyang, North Korea, 09 April 2018 (issued 10 April 2018). Photo by KCNA. Much attention is on what kind of external policies North Korea will decide to pursue in its major parliamentary session Wednesday, just weeks ahead of its summits with Seoul and Washington. North Korea's state-run Korean Central News Agency said last month that the sixth session of the North's 13th Supreme People's Assembly would convene on Apr. 11. The assembly is the highest decision-making organ of the reclusive state, under the North's Constitution, and convenes once or twice a year to determine state budget and major policies, as well as government structure. However, this year, observers are wondering whether the session on Wednesday will address Pyongyang's upcoming summits with South Korea and the United States, as regime leader Kim Jong Un did the previous day. In a meeting of the Workers' Party Central Committee's Political Bureau Tuesday, Kim reportedly explained the recent developments in inter-Korean ties, and the prospects of his talks with U.S. President Donald Trump. The KCNA report said Kim outlined "strategic and tactical issues" for the Workers' Party, as well as the "future policy of international relations." The report did not explain further on what kind of issues or policies Kim was pertaining to. He also told bureau members that the inter-Korean summit would take place Apr. 27 at the Peace House on the southern side of the Panmunjom truce village. "It appears there were discussions regarding the inter-Korean or North-U.S. summit (at the bureau meeting. So we will pay close attention to what major policies or policy directions are set at the Supreme People's Assembly meeting," Seoul's Unification Ministry official Baik Tae-hyun told reporters Wednesday. Observers also believe there may be major reshuffles in top government posts, as two Assembly members Hwang Pyong-so and Kim Won-hong stepped down from the State Affairs Commission. South Korean experts also say 90-year-old Assembly chief Kim Yong-nam may also be replaced, in a bid to pursue more active diplomacy, Yonhap reported.